Add a touch of Asia and a soothing light source to your exterior living space. Hang these stylish bamboo lanterns year-round. 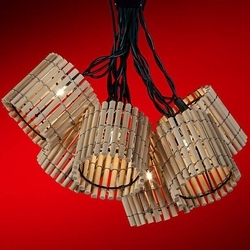 A great accent piece, this strand includes ten lights. This lighting will make a wonderful addition to your indoor or outdoor decor. Make an Asian statement! •Safe for use indoors or outside.